There was an astounding statistic in the National Association of Manufacturers' (NAM) quarterly economic report this week. Among the predicted remarks about a strong dollar and the country's recent temporary slowing in manufacturing growth, out came a promising trend of increased manufacturing construction spending. In January 2011 the country had approximately $30 billion in ongoing manufacturing construction projects, according to NAM. That number steadily increased to just over $90 billion in September 2015. That's a whopping 200 percent increase in the average monthly value of spending in four years. This is good news for the country and could potentially be great for California, assuming we are attracting a proportionate share. NAM's economist, Dr. Chad Moutray, pointed to the chemical manufacturing industry as a major reason for the steady spike with approximately 246 currently announced construction projects. Of course we don' know the location of those projects but eventual investment data at the end of the year might reveal a large portion of them. To understand how California and our western region might be attracting its share we looked a little deeper into the spending data by region at the Census Bureau. 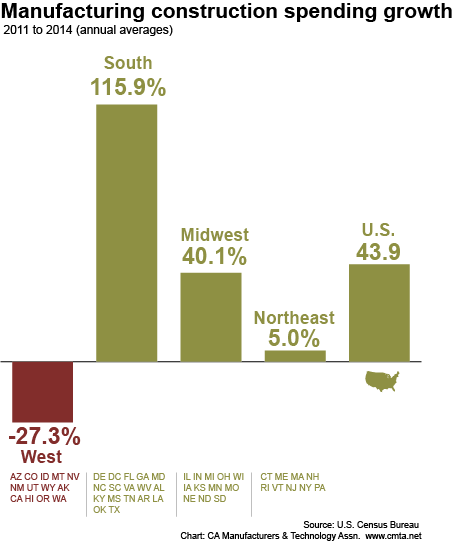 From 2011 to 2014 (most recent annual number for regional data, so 2015 is not included) the western states declined in spending by 27 percent, while the South increased by 115 percent. Below is a look at all four regions. Given the numbers, we'll keep an eye on this data as more is revealed.